What is MMF (MicroDaily) the Military Vitamin? SCIENCE - The antioxidant micronutrient science behind MMF has been proven in 14 clinical trials and seven patents that clearly show the efficacy of MMF. MMF was based around a scientific breakthrough called The CQF Standard - Combination, Quantity and Form. By having the right combination of antioxidant micronutrients in the proper quantities using the specific natural biologic iso-forms, MMF unlocks the body's full potential by maximizing absorption and delivering maximum results. SMART PILL - The unique CQF approach delivers a smart pill that starts with absorption and ultimately provides protection for the fragile double strand cornerstone of human life known as DNA. 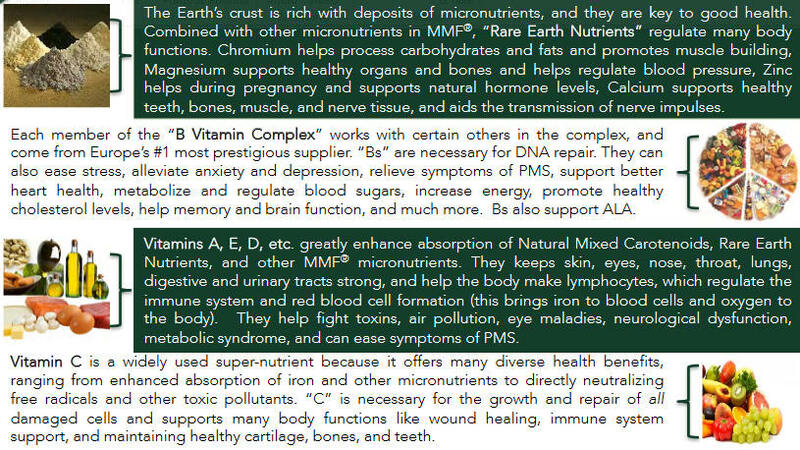 MMF is a body-defense nutraceutical that was designed to work intelligently with the needs of your individual immune system. and repair and protect DNA. MMF was originally developed for military use, not the consumer market. It is now available to you exclusively through Engage Global Independent Members. MMF has been proven in clinical trials, in a lab, and in life. This is an Independent Engage Global Consultant Website and NOT a Company website.